Hoshiarpur: Dal Khalsa today criticised CM Amarinder Singh led Punjab Government for not suspending IG Paramraj Singh Umranangal despite his being in custody since last ten days. The organization also accused the government for lacking will power to arrest ex-DGP S S Saini in Kotkapura firing and Behbal Kalan killings. 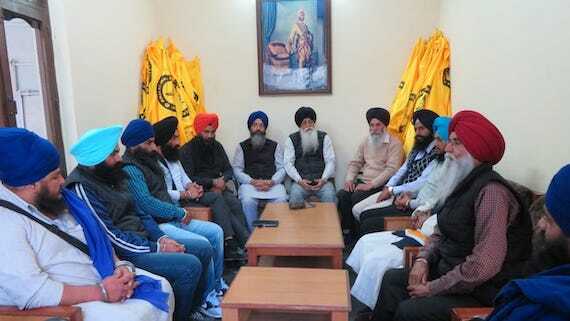 To take stock of the situation arisen out of hovering of War clouds over India and Pakistan and Amarinder govt’s dilly dallying tactics in arresting Saini and providing VIP treatment to detained Umranangal in jail, the meeting of Dal Khalsa was held here today. Party leader H S Dhami said despite the SIT arresting the IG in criminal case the Govt has hardly shown any interest in putting Umranangal under suspension. Similarly the SIT hasn’t issued a 7 day advanced arrest notice to Saini till date. This puts a big question mark on govt’s sincerity to deliver justice. He said in violation of jail rules, the authorities under pressure from police has provided two security guards to Umranangal in jail under the garb of security threat to him. Instead of showing him his right place as an accused, the authorities are treating him as a VIP, he alleged. This shows the double standards of the administration, said he. The meeting appreciated the Pakistan PM Imran Khan for showing large heart in releasing captured wing commander unconditionally. Dhami said this gesture of khan has somewhat eased the tension though temporarily between both the hostile countries. He said People of Punjab are opposed to war between both the neighbouring countries as they feel theirs state being border state would be worst effected and completely destroyed. He told the media that theirs group has written to United Nations and P-5 for mediation and intervention to prevent both countries going to war. Paramjit Singh Tanda and Ranbir Singh, both office bearers of the organization urged the Takhat Patna Sahib management board to sack “disgraced and controversial” Jathedar Gaini Iqbal Singh in its meeting schedule for 5th.